What will do if you are in a place where AC is not available to power your gadgets ? 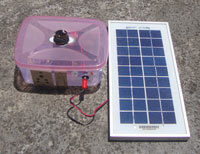 You can carry this Portable Solar Generator to a Picnic spot where AC is not available. It lights a CFL to provide sufficient light and AC for charging Mobile Phone, Tablet etc and can even play a small CD player. Alternately you can use the unit in home during Power Outage days. It converts the 12 V DC from the battery to 220V AC to light the CFL. It has a bulb holder to fix the CFL and an AC outlet to tap AC for other purposes. It uses a simple 20 Watts CFL Driver board to converts DC to AC. The battery can be charged using a 12 V Solar panel or 12V DC Adapter. The battery used in this unit is 12V 3 Ah (3 Ampere Hour) rechargeable Lead acid battery which can power the CFL many hours.